In the last ten years (Patio Garden Design) the garden has taken on a new significance as an outdoor area reflecting individual lifestyle choices and an extension of available space. Whether it is for a place to relax and entertain, or somewhere to surround yourself with the beauty of your favourite plants. In effect a room without walls. Rance Landscapes as a Patio Garden Design specialist can help you create that special space which reflects your tastes and personality. 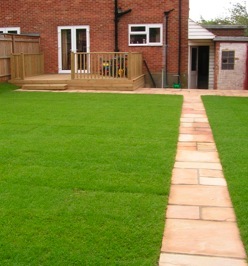 Our experience as Landscape Gardening Specialists who have worked with a variety of materials and methods such as various types of paving and natural stone products, and varieties of garden/timber decking. We will make your Patio Garden Design experience enjoyable by presenting you with a variety options from which you can create that special outdoor space you desire. From experience, the majority of our customers choose either a paved or timber decking design for their patio area. You might want to be different and consider a mixture of both! Along with your chosen materials, you might want to consider shrubs, plants and other additions such as lighting to create your special effect. Your choice of Patio Garden Design will be a reflection of your style and tastes, and requires careful consideration so that you achieve what you want. Imagine, it's a summer evening and you are hosting an intimate party for close friends on your new paved or timber decked patio area. Do you already know how your new outdoor area will be furnished? It can be an exciting experience. Rance Landscapes are here to help you achieve that special Patio Garden Design that reflects you, your tastes and lifestyle. So, if you have been dreaming about how you can make your summer evenings more interesting by indulging in more outdoor living and your not sure that your current garden area meets those dreams. We can help you to create that special place.